Database Marketing helps you implement effective marketing initiatives and build customer relationships with the use of data-driven databases and strategic marketing services. If your business requires you to connect and engage with your audience through the use customer and prospect data, you need a targeted list and marketing support to ensure your marketing initiatives are successful. 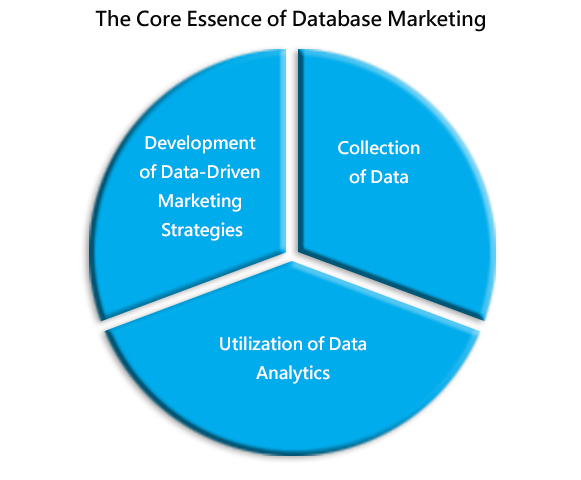 Collection of Data – The first step in database marketing is collection of customer and prospect data from various sources such as B2B events, surveys, landing pages with lead capture forms, data capture through websites and email campaigns, social media campaigns, other online sources and third party vendors. Utilization of Data Analytics – Owning a database is of no use if it does not provide valuable insights on your target market. Another aspect of database marketing is the translation of data into actionable insights, by using tactics such as segmentation, profiling and scoring, to identify specific groups with characteristic behavior and preferences. Development of Data-Driven Marketing Strategies – Once you have insights about your customers and prospects through data analytics, you need to translate them into strategies. By choosing a niche audience, creating marketing messages that resonate to them and by using channels they popularly use, you can increase engagement, response, and conversion rates. LakeB2B is a leading provider of Database Services. We provide marketing databases along with strategic, analytical and operational support to cater to your business requirements and enable you to become customer-centric. Specialized in providing custom lists, we provide you with scalable and flexible data and marketing solutions that resonate with your evolving marketing needs.LakeB2B is a leading provider of Database Services. We provide marketing databases along with strategic, analytical and operational support to cater to your business requirements and enable you to become customer-centric. Specialized in providing custom lists, we provide you with scalable and flexible data and marketing solutions that resonate with your evolving marketing needs. Our expansive range of database marketing services includes Email Verification & Validation, 360 Degree Profiling, Data Provisioning, B2B Modeling, Hard Bounce Management and Database Licensing Solutions. We provide different types of lists such as Multichannel Prospect Lists, Pre-packaged Lists, Master B2B Database Files, Specialty Data Lists and Custom Wish Lists.